"Hilarious French farce at its best"
"A doctor's frenzied attempts to conceal a secret rendezvous from his wife and mother-in-law lead to a dizzy merry-go-round tangle of wives, mistresses, husbands, and lovers, in this joyfully comic romp of mistaken identities, outrageous excuses and frantic escapes." The first version of 'A Stitch in Time' - a translation of Feydeau's Tailleur pour dames - was written for the National Arts Centre in Ottawa by Dorothy's husband Brian when he was Professor of Medieval French Language and Literature at McMaster University. After his untimely death Dorothy wrote the second version setting it in the Montreal of the 20s. This was played at the Lighthouse Theatre, Port Dover, Ontario together with her own original theme music. 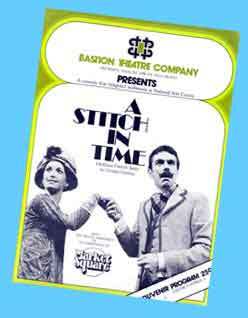 A Stitch in Time was published by Playwrights' Union of Canada in 1998. "French farce at its best . . ..guaranteed to tickle your funny bone." " . . delicious farce . . a comic romp . . vigorous, attractive and fun." "Great fun . . . a splendid romp . . . .a joyful charade . .
the translation has the clear ring of authenticity . .
cleverly inventive . . with absolutely spot-on music composed and played by Dorothy Lees-Blakey".. .